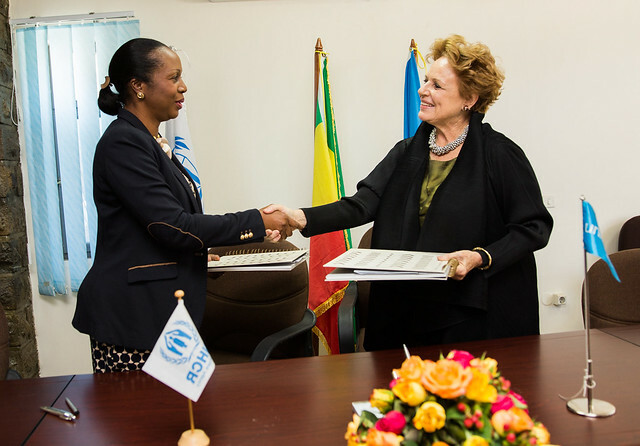 ADDIS ABABA, 18 November 2016 – UNHCR, the UN Refugee Agency, and UNICEF today signed a Letter of Understanding (LoU) and a joint plan of action to further strengthen their partnership in responding to the needs of refugees and host communities in Ethiopia. 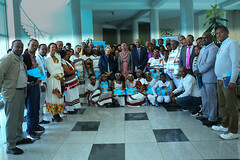 The representatives of the two agencies to Ethiopia – Ms Clementine Nkweta-Salami (UNHCR) and Ms Gillian Mellsop (UNICEF) signed the agreement which outlines key areas of collaboration in child protection, education, health and nutrition, as well as water, sanitation and hygiene (WASH). 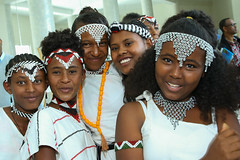 Under the present agreement, which is due to end in August 2020, the two agencies agreed to work together in accelerating their joint refugee response in terms of technical assistance, visibility, advocacy resource mobilization and supply management. In addition, the collaboration will have a strong focus on identifying risks and ensuring that contingency planning and preparedness measures are in place. “UNICEF and UNHCR have a long history of effective and demonstrated collaboration in humanitarian action which has greatly improved the lives of refugees over the years. This agreement will further cement our partnership and help us to advance our respective mandates in Ethiopia,” said Ms Nkweta-Salami. In UNHCR’s case, this means protecting, assisting and finding durable solutions to the plight of refugees and other persons of concern. For UNICEF, it allows for greater advocacy for vulnerable children by making sure that programmes and policies in response to the refugee crisis put the rights and needs of children first. “The decision to have this agreement with UNHCR stems from our wish to formalize the complementarity of our work and ensure that we are jointly delivering results for children. Together, we will intensify our efforts to address the issues of refugees and host communities who need our protection and support,” said Ms Gillian Mellsop. 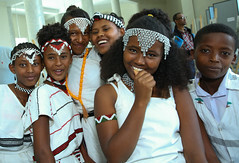 Currently, Ethiopia hosts 783,340 refugees, 58.3 per cent of whom are children under 18 years of age, including 38,502 unaccompanied and separated children. As of September this year, Ethiopia has experienced a new influx of South Sudanese refugees fleeing renewed violence and food shortages. More than 39,000 new arrivals have been recorded with 64 per cent of them being children including more than 8,300 unaccompanied and separated.